This never-before-published collection of fourteen funny and inventive tales by acclaimed author Sir Terry Pratchett features a memorable cast of inept wizards, sensible heroes, and unusually adventuresome tortoises. Including more than one hundred black-and-white illustrations, the appealingly designed book celebrates Pratchett’s inimitable wordplay and irreverent approach to the conventions of storytelling. Have you ever looked around the room on a sunny day and seen little specks of dust floating in the air? They look like stars when the light catches them, and the very small people who live on them think that's what the other specks of dust are. "Well then," said the king, "Ralph, how would you like to visit Crumbling Castle? Nice scenery, excellent food, only a few dragons to kill. Take my spare suit of armor - it's a bit roomy but quite thick." 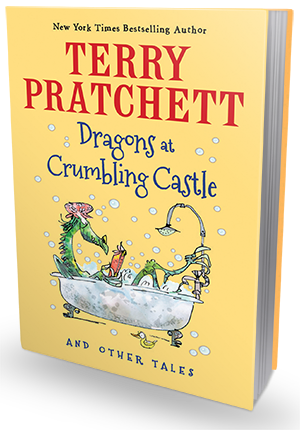 Whimsical, hilariously surreal and hugely entertaining, Dragons at Crumbling Castle is filled with hysterical and clever stories that will delight both young readers and Terry Pratchett's long-time fans. This collection of 14 never-before-published short stories and over 100 black-and-white illustrations is quite a treat to read. Here we have - among others - an adventurous tortoise, eager to explore the world beyond his garden, a group of tiny carpet-dwellers on a journey across the carpet, an inventive caveman named Dok, and, of course, a group of (very polite, if I may say) dragons who were forced to relocate to the Crumbling Castle due to their caves being flooded. It's a very eclectic and flavorful compilation of stories, each of them charming and interesting in their own way. Terry Pratchett's writing is as sharp and unique as ever, his short stories - funny, intelligent and completely over-the-top (in a good way!). Of course, you can tell that these stories were written by a "naive young lad", and even Pratchett himself jokingly admits to them being not the greatest, but they're fascinating to read and very enjoyable nevertheless. They're simple and very straight-forward, often times beyond bizarre and extremely imaginative, and in the end you can't help but grin from ear to ear. They bring to mind Pratchett's first Disc World novels. Pratchett's distinct narration style is there, his quirkiness and cleverness shines through, too, and that makes these stories very special and very meaningful. Personally, I though this was a great collection, full of Pratchett's signature humor. I had so much fun with these stories - I laughed and admired the quirky illustrations, all the while picturing young Sir Terry Pratchett in my mind. Bottom line is, Dragons At Crumbling Castle is definitely a must read for all Pratchett's fans!